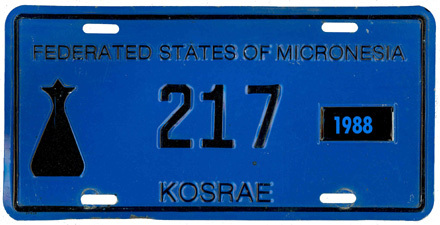 Kosrae's license plate history goes back to 1977, when the island was part of the Trust Territory of the Pacific Islands (T.T.P.I. ), which was being administered by the United States of America. During the 1980s, the island of Kosrae became part of the Federated States of Micronesia. Current series valid since 1988 has a 4 digit embossed blue serial number on the 'Island of the Sleeping Lady' graphic base. 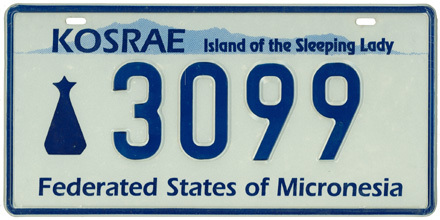 Official Government plates have the legend 'KOSRAE STATE' at the top and 'GOVERNMENT VEHICLE' at the bottom. There are other plate types observed, including a legislature vehicle and the Governor plate. 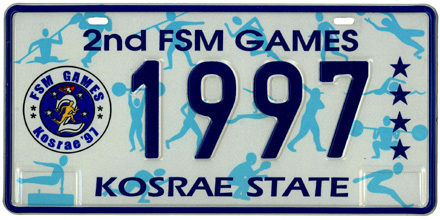 In 1997, Kosrae hosted the second FSM Games. A commemorate souvenir license plates with the serial number '1997' were distributed during the festivities.